I have been trying to finish off some projects that I have left untouched for numerous years, and here is one of them. 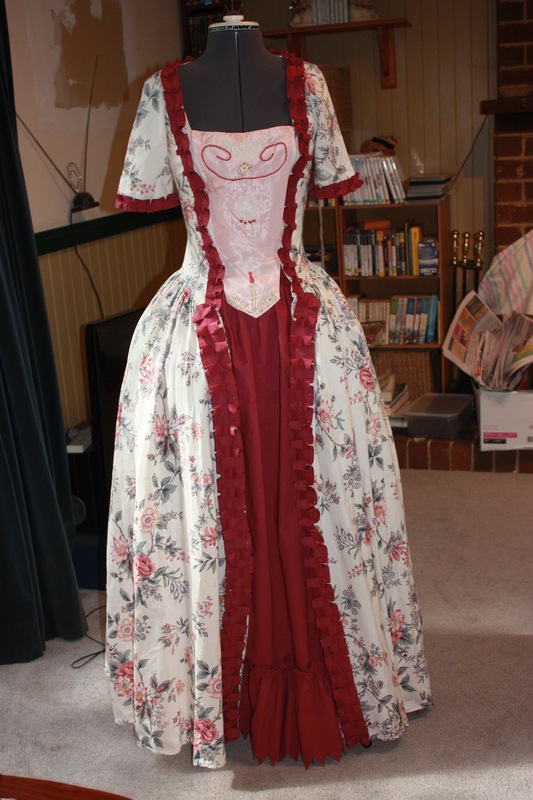 Twelve years ago I made an 18th century open gown out of an old curtain I found at a second-hand shop. 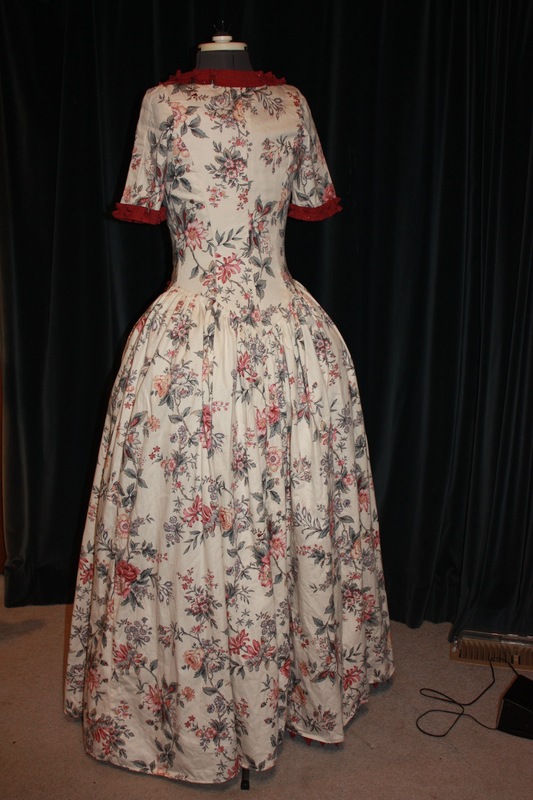 I had also made a petticoat out of a piece of faded material that sort of matched. Whilst I had worn it, I had never finished it off with the trims that I wanted to. In fact, I had to reduce my dressmakers dummy down to the smallest it could go in order to make it fit even her! (Doesn’t she look tall and skinny!) It makes me wonder how it ever fitted me in the first place!?! The gown is probably closest to a robe a l’anglaise, though the bodice is cut much more like a modern bodice would be, with a bodice and gathered/pleated skirts attached. 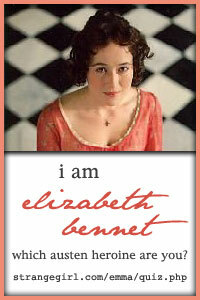 It is shown pinned over a stomacher, which is just an unboned piece of taffeta, or something similar. 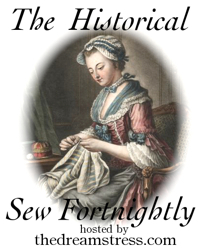 It had been a quick attempt at embroidery and decorating so that I could wear it dancing, and I had planned to make a new (proper) stomacher until the discovery that 12 years and 5 children have changed the shape of my body! With the new petticoat, the stomacher doesn’t really match very well anymore. 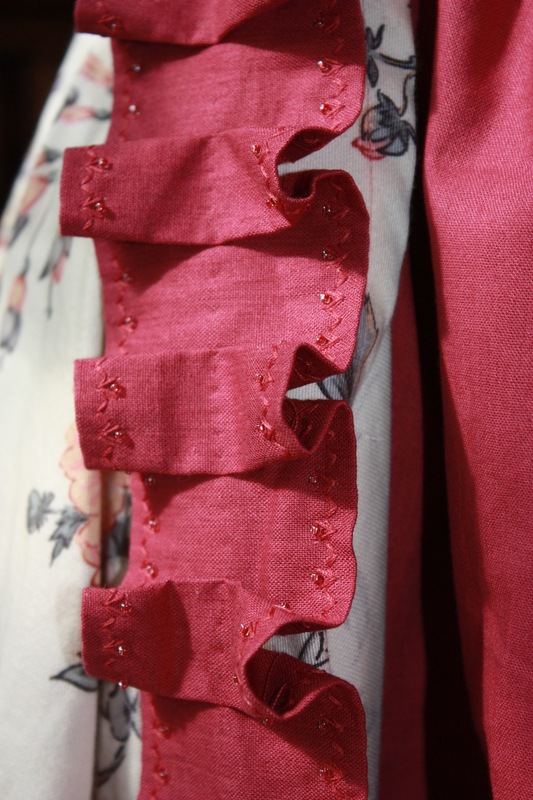 I had also intended to make some embroidered lawn ruffles to wear at the sleeves. I was really disappointed about it not fitting… mainly because I love this material, and I had worked hard to cut it out as economically as possible so that I could make this dress. Luckily, because I have made the petticoat afresh, it fits! So now I plan to make an open front caraco jacket to go over the top, just so I can wear it! This means that the new stomacher and lawn ruffles are also back on the list of things to do. And if you were interested in seeing what goes under this ensemble, here they are. 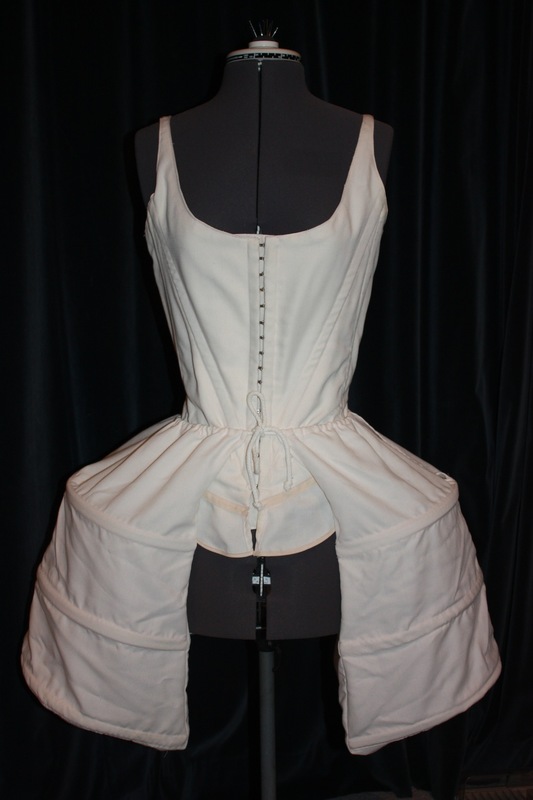 Undergarments: This was the first corset I ever made. 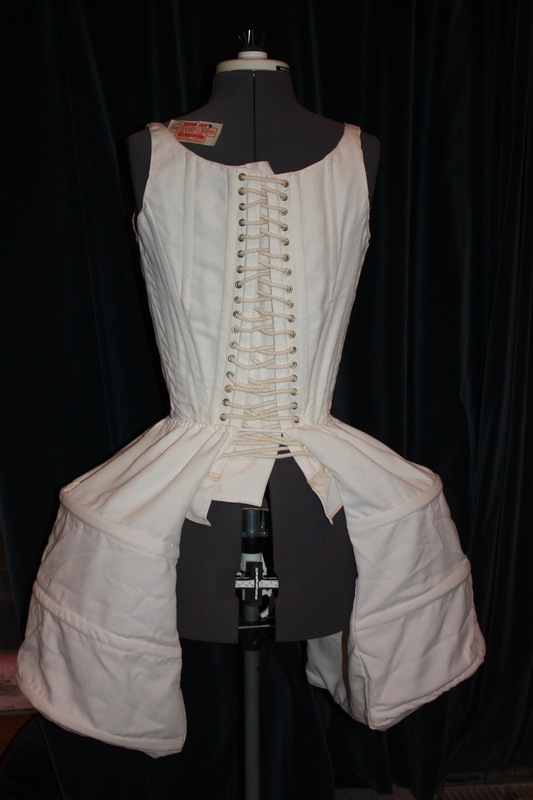 I drafted it from a picture of different undergarment patterns that I found in a book about constructing theatre costumes, so it is a pretty basic corset. It has a line of hooks and eyes down the centre front, and a little “skirt” at the bottom to imitate the 18th century tabs. The panniers are just a half cylinder of fabric held in shape by boning, and then tied together with some cord that runs through a casing at the top. So now it is on to the caraco jacket, and a new stomacher! Wow, it must feel so good to have finished this after all those years 🙂 I love it! Thank you! It is a good feeling to finish things, that’s for sure! That is just gorgeous…I love the fabric! So do I! Believe it or not, I had never washed it since it was an old curtain, so I soaked it in Nappy-San and it came up a treat. The colours look lovely and the cream is now cream (and not yellow)! This dress looks lovely! I especially like the undergarments 🙂 Also I’m so jealous, you make drafting sound so easy! It must really free you creatively not having to rely on commercial patterns. And as we can see, it really shows in the finished product! Thank you! It is probably just practise though. For this dress I used a pattern of a bodice from a formal gown (a McCalls or Simplicity pattern from memory) that I knew fitted me nicely. Then I just adjusted it as necessary. The main adjustment was in the front V-section where the stomacher goes. I just kept fitting it to myself until I got the look right. As I have continued to practise those adjusting and adaptation skills (from commercial patterns), it has become easier and easier to do. I would love to do a short course in pattern drafting though! Then I might learn some tricks of the trade!